Umineko: When They Cry (うみねこのなく頃に, Umineko no Naku Koro ni, lit. When the Seagulls Cry) is a Japanese dōjin soft visual novel series produced by 07th Expansion. The first game in the series, Legend of the Golden Witch, was first released at Comiket 72 on August 17, 2007 playable on Windows; the game sold out in thirty minutes. The story focuses on a group of eighteen people on a secluded island for a period of two days, and the mysterious murders that befall them. Readers are challenged to discern whether the murders were committed by a human or of some other supernatural source, as well as the method and motive behind them. Umineko is the third title in the When They Cry series, preceded by Higurashi no Naku Koro ni and Higurashi no Naku Koro ni Kai, and followed by Umineko no Naku Koro ni Chiru. Square Enix, Ichijinsha, Kadokawa Shoten, and ASCII Media Works all published various manga adaptations of the series. It was also turned into a 26-episode anime by Studio Deen, which aired in Japan between July and December 2009. A series of novels written by Ryukishi07 are published by Kodansha Box. A fighting game based on the franchise, Umineko: Golden Fantasia was released by 07th Expansion on December 31, 2010. Umineko When They Cry is a murder mystery game described as a "sound novel" by 07th Expansion. A sound novel is similar to a visual novel, though the gameplay requires no player interaction as the game is composed entirely of text dialogues. While a visual novel's basis would be the visual aspect, as the name suggests, a sound novel's basis takes more care in producing an atmosphere via the music, sound effects, and the story itself. As such, the original Umineko games have a simple-looking art style, which stays consistent over the course of the series' releases. The original releases contain no voice acting for the characters. During gameplay, the Tips Mode can be viewed via the game's internal menu, which also includes save and load functions. This mode allows the player to read various supplementary information on the characters and story that may or may not be useful in solving the mystery. These are updated according to the progression of the story. The goal of the game is to try to come up with a solution to the many murders and mysterious events that occur, and discern the truth of the events of the story. An in-game feature introduced in Turn of the Golden Witch is the "red truth", where any text written is red is said to state the indisputable truth, offering clues to the reader to both create theories as well as to break them. In contrast to this is the "blue truth" introduced in Alliance of the Golden Witch, which is used to present theories that deny the witch while abiding by existing red truths. If not countered by a relevant red truth, blue truths may be treated as actual fact. The mansion in Kyu-Furukawa Gardens in Kita, Tokyo, basis of the exterior of the guest house on Rokkenjima. Umineko no Naku Koro ni is primarily set on October 4, 1986 on Rokkenjima (六軒島), a small island privately owned by the wealthy Ushiromiya family. The Ushiromiya family gathers for the annual family conference, which concerns the division of assets belonging to Kinzo, the ailing family head; in addition to the twelve family members are five of their servants and Kinzo's physician, comprising a total of eighteen people. Battler Ushiromiya, one of Kinzo's grandchildren, has been absent from the family conference for the past six years, having lived with the family of his deceased mother, Asumu, and renounced the Ushiromiya name during the time out of protest towards the remarriage between his father, Rudolf, and his second wife, Kyrie. Upon his return, Battler becomes reacquainted with the legend of the "Golden Witch" Beatrice, who is rumored to have given Kinzo ten tons of gold in the past to revive the Ushiromiya family, which had been crippled in the 1923 Great Kantō earthquake. A portrait of her lies in the entrance hall of the Ushiromiya family mansion, and a puzzling epitaph is written below it. It is rumored that whoever solves the epitaph's riddle will receive the gold and become the successor to the Ushiromiya family. A typhoon soon traps the eighteen people on the island, and occult-like murders begin to occur in accordance with the contents of the witch's epitaph, often in ways that seem impossible for a human to have committed. At the end of the first game, the ceremony described by the epitaph is completed and the witch Beatrice revives. Battler, the only one who refuses to acknowledge the existence of witches or magic, is sent to a parallel dimension, Purgatorio, from where events on Rokkenjima can be overseen. From this point on, Battler and Beatrice become locked in a game of twisted logic where the murders on Rokkenjima repeat themselves in different ways. Battler's goal is to attempt to explain all of the mysterious events on Rokkenjima from the standpoint that they are caused by a human, while Beatrice's goal is to deny Battler's theories until he is forced to accept her existence. In the final two games, Beatrice's true identity is revealed to be Sayo Yasuda, Kinzo's illegitimate child, who masquerades as two of the family's servants, Shannon and Kanon. Bearing a grudge against the Ushiromiya family, and resenting Battler for forgetting their relationship during his six-year absence, Sayo plots several ways to commit a mass murder-suicide, which are embellished as a fantastical murder mystery written in message bottles that Sayo throws into the sea, forming the basis of the "mysteries" that Beatrice presents Battler in Purgatorio. On the intended day of the crime, however, the family is massacred by Rudolf and Kyrie in a deadly scuffle over the gold's distribution until Battler's aunt Eva, the only known survivor of the event, kills the two in self-defense. Battler and Sayo also escape, but Sayo commits suicide by drowning at sea, while Battler sustains brain damage while attempting to rescue Sayo, developing a permanent identity disorder as a result. Going by the name Toya Hachijo, Battler uses his retained memories and Sayo's message bottles to determine the truth of what occurred on the island. Umineko no Naku Koro ni (うみねこのなく頃に, lit. When the Seagulls Cry) consists of the first four arcs of the series. They are referred to as the Question Arcs and introduce the world of the story and its mysteries. Each arc in this series contains all the previous arcs. This chapter introduces the player to the main setting of Umineko no Naku Koro ni as the Ushiromiya family gather on the island of Rokkenjima for their annual family conference. The player is familiarized with the island's 18 residents (consisting of the Ushiromiya family and servants) as well as the legend of the Golden Witch, Beatrice. As the story progresses, people on the island are murdered, and the family is taunted by letters that claim to be from the witch Beatrice, who takes responsibility for the murders and intends to take back everything of the Ushiromiya family. Following the events of the first chapter, this chapter introduces the "meta-world", where Battler is locked into a battle of twisted logic with the witch Beatrice as the murders on the island repeat in a different way. Beatrice also arrives on the island as its 19th resident, and fantastical elements are introduced into the story. The chapter also focuses on George and Jessica's relationships with the Ushiromiya family servants, Shannon and Kanon. The third chapter continues the repeating murders, with a special focus on Eva Ushiromiya, Kinzo's first daughter. Unlike the first two chapters, the adults of the Ushiromiya family make a serious attempt to solve the riddle of the epitaph. Eva succeeds in this task and finds the gold, but a witch persona of Eva continues to carry out the murders in Beatrice's name. This chapter introduces Battler's sister Ange as a secondary protagonist, who survived the Rokkenjima massacre due to being absent and was taken in by the only survivor of the incident, Eva. It has a shifting focus of events, showing readers Ange's life in the aftermath of the incident and exploring her relationship with Maria and magic through Maria's diary. The Ange of 1998 sets out on a journey to uncover the truth of Rokkenjima, while the events on the Beatrice's gameboard repeat for the fourth time. Umineko no Naku Koro ni Chiru (うみねこのなく頃に散, lit. When the Seagulls Cry Breakdown) tells second half of the story, delving deeper into the core of the mystery while providing more clues towards the truth of Rokkenjima. Each arc in this series contains all of the previous Chiru arcs. This chapter introduces a new game master in the form of the witch Lambdadelta. Another witch, Bernkastel, takes primary control of the human side in the game. She introduces a new visitor to the island in the form of the detective Erika Furudo, who approaches the murders from a "mystery" perspective, unlike Battler who had taken an "anti-fantasy" stance. The chapter also has a focus on Natsuhi, who receives threatening phone calls from a "Man from 19 Years Ago". Having become the new game master, Battler Ushiromiya is tasked in this chapter with creating his own gameboard as a way of demonstrating his understanding of Beatrice's game. Like Turn of the Golden Witch, Battler's game has a focus on the lovers, and also introduces a reborn Beatrice who struggles to discover the person she once was. This chapter presents an alternate reality where Battler does not come to Rokkenjima, the Golden Witch does not exist, and a mysterious child is now the designated successor to the Ushiromiya family. The protagonist is Willard H. Wright, who is tasked by Bernkastel to uncover the truth behind Beatrice. The chapter delves into the past experiences of several characters, including Kinzo and the person who would become Beatrice. The final chapter focuses on Ange Ushiromiya, who in her quest to discover the truth behind the events of the Rokkenjima incident is given the chance to go to Rokkenjima as a six-year old by Battler. Unlike the previous chapters, this chapter has features which require direct interaction from the player, allowing the player to unlock extra scenes as well as make the choice between two endings. Umineko no Naku Koro ni Tsubasa (うみねこのなく頃に翼, lit. When the Seagulls Cry Wings) is a fan disc compilation of additional tips written by Ryukishi07 outside of the games, released on December 31, 2010 alongside Twilight of the Golden Witch. Several of the stories are humorous in tone, but the more serious ones are considered canon. A letter Bernkastel writes to the player which contains her musings and speculations on the rules XYZ in Umineko. It ends with a couple of poems, one written by Ronove, and one written by Frederica Bernkastel. Beatrice grants a wish for Maria, and Bernkastel grants a wish for Ange. The latter event shows Bernkastel as a cruel, ruthless witch. While he is making Dawn of the Golden Witch, Battler is approached by all the other characters, who are willing to do anything to get a bigger role in his game. On Mother's Day, Jessica makes a contract with Furfur and Zepar in order to bear the burdens of her mother. However, things go wrong when all of Natsuhi's hardships are transferred to Jessica while Natsuhi enjoys a day of good luck. Jessica again enlists the help of Furfur and Zepar to aid in a fight with a friend. The charm is a success, and Furfur and Zepar officially give her their book of charms. With the book in hand, Jessica decides to try to get Kanon to dream about her, and things don't go exactly as planned. Talks about Lambdadelta and her history of granting wishes. Talks about Gohda's past. This tip shows that red circles appear before the murders have even started. Battler, George, Jessica, and Maria go shopping together to choose Thanksgiving Day gifts for their parents. When they go to deliver the gifts, they find that their gifts have been switched around without their knowledge, thanks to Beatrice's meddling. Ronove gives chocolates to the Sisters of Purgatory and instructs them to give them to those who are foremost in their hearts. Asmodeus is the first to give away her chocolate, giving it to Amakusa. Beelzebub chooses Gohda so he can make her a superior dish for White Day. Mammon gives her chocolate to Sakutaro and plans to share it with Ange. Belphegor and Leviathan give their chocolates to Rudolf and Kyrie, respectively, out of admiration due to their encounter in Banquet of the Golden Witch. Satan attempts to give her chocolate to Kanon, but is rejected and driven away by Jessica. Lucifer fails to find anyone and is scorned by her sisters until Battler comes and accepts her chocolate. Beatrice later receives the same chocolate from Ronove and tries to give hers to Battler, passing it off as her own, but Battler, recognizing it as the same chocolate as Lucifer's, accuses Beatrice of stealing from Lucifer (believing that Lucifer made her chocolate herself). The sequel to The Seven Sisters' Valentine, in which the Sisters of Purgatory receive presents from the persons they gave their Valentine's chocolate to for White Day. Beatrice, however, must cope with not receiving a present from Battler since she lied about making the chocolate she tried to give him on Valentine's Day. Beatrice's jealousy is even more fueled when she learns that each Sister of Purgatory receives a present from the person they gave their chocolate to, especially Lucifer who gave her chocolate to Battler as well. When Beatrice demands a present from Battler, he retaliates that she never even gave him chocolate a month ago. It turns out that Beatrice eventually ate the chocolate that Battler rejected on Valentine's Day itself... and she tries to destroy the Sisters' White Day. Battler angrily declares in red that he will never get her a present for White Day. After Beatrice tries to make it up to him by making her own chocolate, Battler agrees to give her a present one month after White Day. Bernkastel is invited to a Tea Party by Lambdadelta and Featherine. Bernkastel's journey to the Tea Party involves avoiding the traps set by Lambda and Featherine in order to not become a laughingstock. Meanwhile, the hosts of the tea party make a bet on whether Bern will arrive or not. Lambdadelta believes that Bernkastel will be cautious enough not to touch her traps and will arrive, even stating it as the Witch of Certainty, while Featherine replies that Bernkastel will definitely fall for their trap. Sakutaro climbs Mount Purgatory to be reunited with Maria. However, he has to deal with the seven circles of sin, of which he already committed. It is revealed that Virgilia helps him during this time. When Sakutaro finishes every trial, he is given a second chance to return back to Earth or go to heaven. Umineko no Naku Koro ni Hane (うみねこのなく頃に羽, lit. When the Seagulls Cry Feathers) is a second fan disc compilation of two additional tips written by Ryukishi07, released on December 31, 2011 alongside Golden Fantasia Cross. These tips are not collected in Tsubasa or Hane, but were nonetheless written by Ryukishi07. Explains and speculates the concepts of anti-mystery and anti-fantasy in full detail. Umineko When They Cry is the second visual novel series produced by 07th Expansion, the first being Higurashi no Naku Koro ni. The scenario writer for the series is Ryukishi07, who also drew all of the character illustrations. Game direction was handled by Ryukishi07's younger brother Yatazakura, and the overall management of the series was handled by BT until his death in July 2009. Image and text processing was headed by Jika, who took over BT's position of overall management. Background images and photography were provided by Yatazakura, Zekozakura, Mali., and All Season Kisetsu no Irodori. The games were designed using the game engine NScripter. The music of Umineko was provided by various music artists including both professionals and dōjin artists, and Dai, the composer of most of the music found in the answer arcs of Higurashi, also had a hand in the project as the music director. The word umineko is the name of a kind of seagull known as a Black-tailed Gull. Naku means "to make sound" (鳴く), specifically referring to those sounds made by non-human organisms. According to the original creator, Ryukishi07, the red character Na (な) in the logo is an official part of the title. The first game of the Umineko When They Cry visual novel series, titled Legend of the Golden Witch, was first released on August 17, 2007 at Comiket 72. The second game Turn of the Golden Witch was released on December 31, 2007 at Comiket 73, and the third game Banquet of the Golden Witch was released on August 16, 2008 at Comiket 74. The fourth game Alliance of the Golden Witch was released on December 29, 2008 at Comiket 75. The first game in the Umineko no Naku Koro ni Chiru series, entitled End of the Golden Witch, was first released on August 15, 2009 at Comiket 76. The sixth game Dawn of the Golden Witch was released on December 30, 2009 at Comiket 77. The seventh game Requiem of the Golden Witch was released at Comiket 78 on August 14, 2010. The eighth game Twilight of the Golden Witch was released at Comiket 79 on December 31, 2010. A fan disc titled Umineko no Naku Koro ni Tsubasa was released the same day as Twilight. A second fan disc titled Umineko no Naku Koro ni Hane was released at Comiket 81 on December 31, 2011. MangaGamer released the Windows games on Steam. Taito released a version of Legend of the Golden Witch playable on certain mobile phones on March 31, 2009. The game is playable on FOMA 900 and i703 phones, using BREW as a runtime environment. A remake for the PlayStation 3, subtitled Majo to Suiri no Rondo (魔女と推理の輪舞曲 (ロンド), lit. The Rondo of the Witch and Deduction), was released by Alchemist on December 16, 2010. The release covers the original four games, and its features include a full HD rendition, all of the original soundtracks from the PC games, and full voice acting. 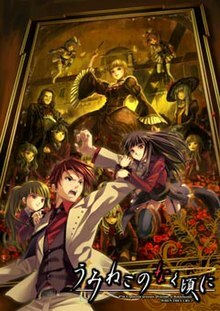 Umineko no Naku Koro ni Chiru was similarly remade for the PlayStation 3, subtitled Shinjitsu to Gensō no Nocturne (真実と幻想の夜想曲 (ノクターン), Shinjitsu to Gensō no Nokutān, lit. The Nocturne of the Truth and Illusions) and released by Alchemist on December 15, 2011. Both remakes were to be ported to the PlayStation Portable under the title Umineko no Naku Koro ni Portable (うみねこのなく頃にPortable), each to be released as two separate games. Rondo was split into Portable 1 (which covers Legend and Turn) and Portable 2 (which covers Banquet and Alliance), released on October 20 and November 17, 2011, respectively. Nocturne was to be split into Portable 3 (which was to cover End and Dawn), and Portable 4 (which was to cover Requiem and Twilight), but both games never came out. A dōjin 2D fighting game produced by 07th Expansion titled Golden Fantasia (黄金夢想曲, Ōgon Musōkyoku) was released on December 31, 2010 at Comiket 79. An append disc, titled Golden Fantasia Cross, was released at Comiket 81 in December 2011. In addition, an Xbox 360 port of the original game developed by Alchemist was released on October 6, 2011 under the title Golden Fantasia X. On November 3, 2018, developer Catbox Creative announced they would be releasing a Kickstarter for an updated version called Umineko When They Cry: Gold Edition. The game will have an English dub. A manga version of Legend of the Golden Witch drawn by Kei Natsumi began serialization in the January 2008 issue of Square Enix's Gangan Powered, which was later transferred to the debut May 2009 issue of Gangan Joker after Gangan Powered was discontinued, and continued until the September 2009 issue. An adaptation of Turn of the Golden Witch drawn by Jirō Suzuki began serialization in the August 2008 issue of Square Enix's GFantasy. The manga adaptation of Banquet of the Golden Witch began serialization in the October 2009 issue of Gangan Joker and is illustrated by Kei Natsumi. Sōichirō draws the adaptation of Alliance of the Golden Witch, which began serialization in Square Enix's Internet-based magazine Gangan Online on October 1, 2009. The first bound volume for Legend of the Golden Witch was released in Japan on June 21, 2008 under Square Enix's Gangan Comics imprint. Yen Press licensed the various Umineko manga published by Square Enix for release in North America. A four-panel comic strip entitled Umineko Biyori: Rokkenjima e Yōkoso!! (うみねこびより。～六軒島へようこそ! !～) and illustrated by Makoto Fugetsu was serialized in Ichijinsha's Manga Palette Lite magazine between March 1, 2008 and March 2, 2009. A single bound volume for Umineko Biyori was released on June 22, 2009. Another manga, Umineko Dōri no Peru-san (うみねこ通りのペルさん), is illustrated by Satoshi Shinkyo and was serialized between the November 2008 and May 2009 issues of Kadokawa Shoten's Comp Ace magazine. A cross-over manga drawn by Yuki Hiiro and featuring characters from Higurashi no Naku Koro ni titled Umineko no Naku Koro ni EpisodeX Rokkenjima of Higurashi crying was serialized in ASCII Media Works's Dengeki G's Festival! Comic magazine between January 26, 2009 and February 23, 2011. Two volumes of EpisodeX were released, the first on February 26, 2010 and the second on April 27, 2011 under ASCII Media Works' Dengeki Comics imprint. Frontier Works began to produce a set of drama CDs for Umineko starting with the first volume Ōgon no Kakeratachi (黄金のカケラたち, lit. Golden Fragments) released on June 24, 2009. The second volume, Ōgon Chō no Miru Yume wa (黄金蝶の見る夢は, lit. The Dream Seen by the Golden Butterfly) followed on July 23, 2009. The voice cast is the same as the anime. Kodansha Box began releasing novelizations of the visual novel arcs in two volume sets, beginning with Legend of the Golden Witch released on July 1, 2009 for volume one and August 4, 2009 for volume two. The two volumes of Turn of the Golden Witch were released in November and December 2009. The novels are written by Ryukishi07. Novelizations of the other arcs were also produced. A 26-episode anime adaptation based on the visual novel series aired in Japan between July 2 and December 24, 2009 on Chiba TV, and aired on additional stations at later times. The anime is produced by the animation studio Studio Deen, directed by Chiaki Kon, and written by Toshifumi Kawase. The opening theme of the anime is "Katayoku no Tori" (片翼の鳥, lit. "One-Winged Bird") by Akiko Shikata, and the ending theme is "La Divina Tragedia: Makyoku" (la divina tragedia～魔曲～, lit. "The Divine Tragedy: Diabolic Song") by Jimang from Sound Horizon. The singles for both songs were released on August 19 and September 16, 2009, respectively. The anime is licensed by NIS America for release in North America and was released in two Blu-ray Disc compilation volumes in December 2012. An Internet radio show titled Umineko no Naku Koro ni Episode R: Radio of the Golden Witch aired ten episodes between August 26, 2009 and January 13, 2010. Produced by Animate TV, the show was hosted by Sayaka Ohara (the voice of Beatrice in the anime adaptation) and featured numerous guests who were also voice actors from the anime such as Daisuke Ono (Battler) and Marina Inoue (Jessica). A special episode was later aired on April 28, 2010 featuring Rina Satō (Ange) and Ryukishi07 as guests. Two CD compilation volumes containing two CDs each were released on December 23, 2009 and January 27, 2010 compiling the ten main episodes. The visual novels have three opening theme songs. The four games of Umineko When They Cry use the opening theme "Umineko no Naku Koro ni" (うみねこのなく頃に, "When the Seagulls Cry"), composed and performed by Akiko Shikata, which was released at Comiket 74 on August 15, 2008, and for public release on August 29, 2008 by Frontier Works. The first two games of Umineko no Naku Koro ni Chiru (End and Dawn) use the opening theme "Occultics no Majo" (オカルティクスの魔女, Okarutikusu no Majo, "Occultics Witch") sung by Ayumu from Zwei. The single for "Occultics no Majo" was released on November 26, 2009 by Geneon. The last two Chiru games (Requiem and Twilight) use the opening theme "Kiri no Pithos" (霧のピトス, Kiri no Pitosu, "The Pithos in the Fog") sung by Nei Kino. The PlayStation 3 versions use different opening themes. Majo to Suiri no Rondo uses "Seikyō no Igreja" (誓響のイグレージャ, Seikyō no Igurēja, "Church of Resounding Oaths"), sung by Kokomi. Shinjitsu to Gensō no Nocturne uses "Inanna no Mita Yume" (イナンナの見た夢, "Inanna's Dream"), sung by Ayumu from Zwei. At the end of each game, there are two ending themes: one played after the completion of the main game (or, in some episodes, after the Tea Party) when the cast of characters is shown and another played after finishing the "????" epilogue when the staff credits are shown. In Legend of the Golden Witch, "Bring the Fate" composed by Hironori Doi is the first ending theme and "Rōgoku Strip" (牢獄STRIP, Prison Strip) composed by -45 is used for the staff credits. Turn uses "Kuro no Liliana" (黒のリリアナ, Black Liliana) composed by U2 Akiyama for the first ending theme and "Senritsu (Shirabe)" (旋律（シラベ）, Melody (Shirabe)) sung by Kazumi Kimura for the staff credits. The first ending theme of Banquet is "Dread of the Grave (Rhythm ver.)" composed by SB Yune and the staff credits theme is "Active Pain" performed by Zakuro Motoki. The first ending theme for Alliance is "Discode" sung by Kanae Sakura and "Rōgoku Strip" is again used for the staff credits. End's first ending theme is "Kodoku na Shinkaigyo" (孤独な深海魚, A Lonely Deep-Sea Fish) composed by -45 and the staff credits theme is "Tsubasa (Hope)" (翼～hope～, "Wings (Hope)") performed by Rekka Katakiri. Dawn uses "Birth of New Witch" sung by Zakuro Motoki as the first ending theme and "Usan no Kaori" (ウサンノカオリ) sung by Nei Kino for the staff credits. The first ending theme for Requiem is "The Executioner" composed by Zts and the staff credits theme "Namae no Nai Uta" (なまえのないうた, Nameless Song) is sung by Kanae Sakura. Twilight has three ending themes, and differs depending on the ending chosen. For the trick ending, the theme used is "Umineko no Naku Koro ni" by Akiko Shikata. For the magic ending, the first ending theme is "Byakumu no Mayu (Ricordando il passato)" (白夢の繭 ～Ricordando il passato～, "Cocoon of White Dreams (Remembering the Past)"), also composed and performed by Akiko Shikata. The staff credits theme is "Engage of Marionette" composed by Dai. An original soundtrack for Legend of the Golden Witch titled Essence was released on August 26, 2009. ^ "Sequel to Higurashi PC Game Debuts at Comic Market 72". Anime News Network. Retrieved 2007-08-20. ^ "Umineko no Naku Koro ni Introduction" (in Japanese). 07th Expansion. Retrieved 2007-06-29. ^ 人気投票、本当にお疲れ様でした。 [Many Thanks for the Popularity Contest] (in Japanese). 07th Expansion. October 22, 2009. Archived from the original on July 31, 2010. Retrieved July 30, 2010. ^ "Gulls, Terns, Puffins and other Gull-like birds". Personal Museum of Natural History. Retrieved 2008-06-23. ^ "Umineko no Naku Koro ni official visual novel website" (in Japanese). 07th Expansion. Retrieved 2008-06-23. ^ a b "Original story section at the anime's official website" (in Japanese). Studio Deen. Retrieved 2009-06-27. ^ "MangaGamer to Release Umineko Visual Novel on Steam". Anime News Network. July 5, 2015. Retrieved August 19, 2015. ^ "Is the Mystery Impossible or Not: Umineko no Naku Koro ni iApli Introduction" (in Japanese). ASCII Media Works. 2009-03-31. Retrieved 2009-06-30. ^ "Umineko When They Cry" 株式会社タイトー 公式ページ うみねこのなく頃に [Taito Corporation Official Page Umineko no Naku Koro ni] (in Japanese). Taito Corporation. Archived from the original on 3 July 2013. Retrieved 19 October 2016. ^ "商品概要 | PS3「うみねこのなく頃に～魔女と推理の輪舞曲～」公式サイト" [Product Summary | PS3 Umineko no Naku Koro ni: Majo to Suiri no Rondo Official Site] (in Japanese). Alchemist. Archived from the original on 3 March 2016. Retrieved 19 October 2016. ^ a b Famitsu (July 24, 2011). "『うみねこのなく頃にPortable 1』と『2』、そしてPS3版『うみねこ散』の発売が決定". Famitsu. Retrieved July 28, 2011. ^ 『うみねこのなく頃に散 ～真実と幻想の夜想曲～』シリーズ完結編が登場 [The Final Volume of the Umineko no Naku Koro ni: Majo to Suiri no Rondo Series Appears] (in Japanese). Famitsu. September 1, 2011. Retrieved September 1, 2011. ^ "魔女幻想がPSPに侵食!? 『うみねこのなく頃にPortable』は4部作で登場". Dengeki Online. July 28, 2011. Retrieved July 28, 2011. ^ "黄金夢想曲/07th Expansion" [Dance of Golden Dreams/07th Expansion] (in Japanese). 07th Expansion. Retrieved November 21, 2010. ^ "Umineko no Naku Koro ni's Fighting Game Gets Sequel". Anime News Network. March 6, 2011. Retrieved July 28, 2011. ^ "Xbox360で「うみねこのなく頃に」のタッグ式対戦格闘ゲームが遂に登場！ようこそ黄金夢想曲の世界へ!" (in Japanese). Alchemist. Archived from the original on 26 March 2016. Retrieved 19 October 2016. ^ "Umineko When They Cry: Gold Edition Announced For Kickstarter". Siliconera. November 3, 2018. Retrieved November 4, 2018. ^ "Yen Press Adds Thermae Romae, Anything and Something, Umineko no Naku Koro ni". Anime News Network. April 7, 2012. Retrieved April 7, 2012. ^ "Comp Ace November 2008" (in Japanese). Kadokawa Shoten. Archived from the original on 8 December 2012. Retrieved 19 October 2016. ^ "Dengeki G's Festival! Comic Volume 5" (in Japanese). Mangaoh. Retrieved 2009-06-27. ^ "Umineko no Naku Koro ni drama CD volume 1 product listing" (in Japanese). Amazon.co.jp. Retrieved 2009-06-20. ^ a b c "Drama CDs section at the anime's official website" (in Japanese). Studio Deen. Retrieved 2009-06-27. ^ "'Umineko no Naku Koro ni drama CD volume 2 product listing" (in Japanese). Amazon.co.jp. Retrieved 2009-06-20. ^ "Umineko novels official website" (in Japanese). Kodansha Box. Archived from the original on 15 July 2009. Retrieved 19 October 2016. ^ "Umineko Anime News" (in Japanese). Studio Deen. Retrieved 2009-04-23. ^ "Umineko no Naku Koro ni staff and cast" (in Japanese). Studio Deen. Retrieved 2009-06-20. ^ a b "Theme songs section at the anime's official website" (in Japanese). Studio Deen. Retrieved 2009-06-27. ^ "NIS America Adds Umineko: When They Cry Mystery Anime". Anime News Network. July 28, 2012. Retrieved July 28, 2012. ^ "うみねこのなく頃に Episode.1 オリジナルサウンドトラック Essence" [Umineko no Naku Koro ni Episode.1 Original Soundtrack Essence] (in Japanese). Amazon.co.jp. Retrieved December 6, 2010. This page was last edited on 5 April 2019, at 11:24 (UTC).